Walking along Grey Street at Brisbane’s Southbank, you may notice the red glass balustrade at the back of the Griffith University Conservatorium. G.James supplied the striking red glass to Queensland Glass who glazed the job. 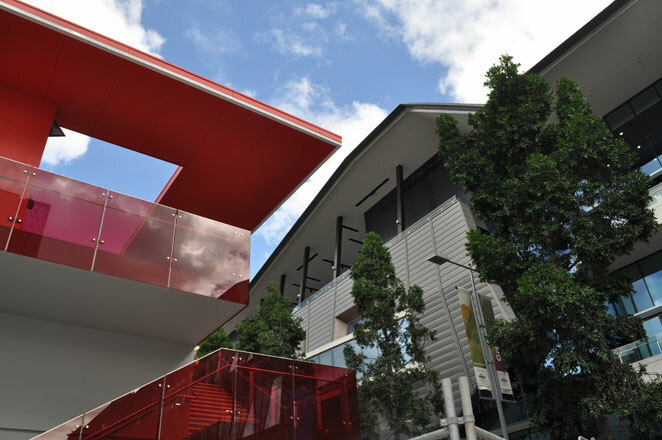 This eye-catching project conforms with the “Griffith University Red” colour scheme and is sure to generate a lot of attention. The Vanceva Colour System uses vibrant coloured safety interlayers to create coloured glass laminates. It has a palette of 14 base colours which can be mixed and matched to provide over 1000 different colour options. Vanceva is a product of Solutia Inc and G.James is one of two authorised manufacturers in Australia and New Zealand. G.James can supply a wide range of Vanceva coloured glass for your project. Contact G.James Glass Sales on (07) 3877 2866. Or visit Our contact page for full details. This entry was posted in Glass and tagged Balustrading, Coloured Glass, Vanceva. Bookmark the permalink.